individuals believe to be orbs, but is usually dust or bugs. Enough with the “orbs” already! “Orbs” are not evidence of the paranormal. They are not ghosts and they are not even “unexplained”! Many of the “orb photographs” that turn up on Internet websites or in books seem to come from cemeteries but they actually have an annoying habit of showing up almost anywhere. They have become the most commonly reported types of “paranormal photos” claimed by “ghost hunters” in recent years. I began debunking the vast majority of “orb” photographs in the middle 1990s, around the same time that I began the controversy over using low-end digital cameras for paranormal investigation. The majority of “orb” photos from that time could be blamed on low resolution, low pixel cameras — but not all of them. Despite what has been seen and heard, there has never been any evidence whatsoever to suggest that these “orbs” are in any way related to ghosts. Yes, they have often turned up in photos that are taken at haunted locations but, as my research started to show, they could turn up literally everywhere. As mentioned, “orb” photos are the most commonly seen “ghost photos” today and you will probably see more photos on the Internet of these purportedly “mysterious” balls of light than of anything else. While I do believe that genuine photographs of paranormal “lights” exist, they are not as common as many people think. The reason for this is that it’s very hard to photograph something at the same time you are observing it. However, it’s been done a number of times over the years at spook light locations and even during investigations. In my book Ghosts on Film, which deals specifically about spirit photography and investigations, I present a number of cases from my files where other researchers and myself were able to photograph glowing lights at the time they occurred. Were they ghosts? I don’t know but I can say that I believe the lights were paranormal in origin — unlike “orbs”. Despite the fact that I (along with many other researchers) have been trying to tell people that “orbs” are easily explained as a natural phenomenon for nearly a decade, those that I like to call “orb-a-philes” have continued to post “orb photographs” on websites, print them in books, display them at conferences and excitedly show them to me on their digital camera screens. When I suggest a possible explanation for the “orbs”, downplaying the idea that they are ghosts, I usually get the reaction that I described in the introduction to this book — anger, righteous indignation and a comment that I don’t know what I am talking about anyway. A typical “orb photograph” is usually one that is taken in an allegedly haunted place and somewhere within the photo is a hovering, round ball. Some of these “orbs” appear to be giving off light, while others appear to be transparent. It should also be noted that “orbs” were actually quite rare (if not nonexistent) before digital cameras became common. In the early days of low-cost, cheap digital cameras, some “ghost hunters” actually proposed that digital cameras are “superior for orb photography”. And since they were producing more “orb” photos, this was technically true. But the digital imaging chip is very different than traditional film photography and was far inferior until recent times. Some of the earlier, low-end digital cameras were made with CMOS chips and they would create “noise” in low-light photographs that would be mistaken for “orbs”. It seemed that when they were used in darkness, or near darkness, the resulting images were plagued with spots that appeared white, or light colored, and where the digital pixels had not all filled in. In this manner, the cameras were creating “orbs”, and they had no paranormal source at all. The most common “orb” photos are merely refractions of light on the camera lens. This occurs when the camera flash bounces back from something reflective in the range of the camera. When this happens, it creates a perfectly round ball of light that appears to be within the parameters of the photo but is actually just an image on the lens itself. Many people often mistake these “orbs” for genuine evidence of ghosts, although I have never really been quite clear as to why that is. Most “orb” photos occur when the camera flash is used. Some of the photographers will insist that their flash was not on, which means it was and they didn’t know it. The automatic exposure control on most any standard 35 mm camera uses fill flash in all but the brightest light. I decided to research “orb” photos from graveyards, which I had seen scores of over the years. Keep in mind that I have often been openly critical of ghost hunting in cemeteries anyway. By that I mean, actually just going out to cemeteries and shooting photographs and hoping to capture something on film. While this is great for the hobbyist, I don’t feel that it’s serious research. Needless to say, I have been harshly criticized for this view. In spite of this, I have not changed my mind about the fact that random “ghost hunting” is not an investigation. And if this isn’t reason enough to discourage this kind of activity; I soon had another reason for taking this view. With three other researchers, I went out to a cemetery that we picked at random on a warm summer night and took several rolls of film. We had no readings, stories or reports to justify the decision, but just took photos anyway. After having them developed, we discovered a number of the photos were filled with semi-transparent “orbs”. What we did was walk around both areas and stir up dust and pollen from the grass. 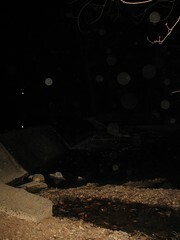 When we took the photos, these particles in the air caught the reflection of the camera flash and appeared to be “orbs”. We also discovered that such photos could be taken after walking or driving on a dusty road. The dust particles would reflect the light, just as moisture can do, and make it seem as though the air was filled was “orbs”. While the experiment really just reinforced a belief that I already had — namely that “orbs” are not paranormal — I do think that it was worthwhile if even one “orb-a-phile” might see the results and question some of the photos that he or she has been presenting as genuine. Editor’s note: this article has not been changed from Mr Taylor’s version on his web site. Thank you for allowing ETX Paranormal to reprint this article. I wonder how a lot effort you set to create such a fantastic informative web site. As a NEW investigator, I found this article extremely helpful and thank you so much! I am a major skeptic when it comes to ORBs. I prefer the sound evidence. Ie.. images, EVPs, video, personal experiences. As for our group, I would discount any and all ORB images. Thats just my opinion, and, since reading this, I am glad we feel that way about showing “orbs”. Thanks again. Thanks for the feedback. You can photograph orbs by using two cameras at the same time pointed at the same area from different angles, according to several researchers. You can also call it an orb if you can see it with your own eyes. The rest can be discounted. I’ve seen more orbs photos online from groups than I care to think about. Sometimes I will try and explain why those are not orbs only some people get rather upset so I keep my info to myself a lot of the time. I find using articles like these can help educate people interested in the paranormal who may have no training other than watching the TV shows. I do watch some of the shows but I also realize it is entertainment. Thanks again for your comment. THANK YOU!!! As a student of psychology and a parapsychology enthusiast, I cannot tell you how much I appreciate your frustrations with people on this “orb kick.” I have 15 years of ghost hunting experience under my belt and I can’t stress enough how delicate and structured investigations need to be. In order to gain any recognition within the APA community, genuine research methods and strict protocol need to be adhered to. Discussion of orbs would get anyone laughed out of any reputable science association.